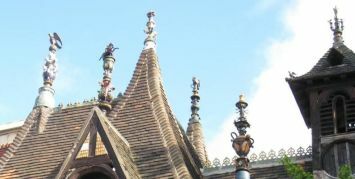 Decorative ridge tiles and finials were particularly popular in the 19th century, with a large varieties of patterns available. Many of the more popular patterns are still made today or can be copied to order. Babylon Tiles Works produce traditional handmade Kent peg tiles. The company was founded in 1989 and is based in Kent, using clay extracted from their grounds in Kent making them truly Kent peg tiles. They are currently producing tiles in various styles and shapes, based on their two colour scheme, traditional terracotta and a darker antique. As well as peg tiles, they produce ornamental tiles, angle and bonnet tiles, saddleback and hogsback ridge tiles and vented tiles. Located in New Romney, Kent, Kent Clay Tiles is leading the way in reviving the handmade clay roof tile industry. Using only the finest clay sourced from the UK and traditional skills combined with modern kiln technology, we have over 50 years combined experience in the handmade clay tile, Peg tile and fittings sector enabling us to advise clients on product and design solutions, technical expertise all backed up by first class customer service support. Tested and approved by Lucideon, our affordable, genuine handmade clay tiles include standard and bespoke colours and styles, offering the architect, specifier or homeowner complete freedom to achieve the roof they desire. The name Keymer has since 1588 has made quality hand made clay roof tiles. The Keymer range includes handmade clay plain tiles, peg tiles, bonnet and ridge tiles in half round, third round, hogback, roll top and coxcomb, as well as ornamental tiles with club, diamond, point, and bullnose fittings. The finials are available in a variety of patterns including the well known wyvern dragon. Discrete in line ridge and tile vents are also available. A family owned and operated business, based in Ashford, Kent, Spicer Tiles specialise in the production of hand made clay peg tiles and fittings. Their tiles display all the hallmarks of a hand made product, subtle variations of size and texture and even foldmarks in the clay, unique features which can only be produced by hand. They also make terracotta floor tiles, and can make the following to order ; oast tiles, mono ridge, mathematical tiles, mansard tiles and ornamental tiles. William Blyth was established in 1840 and takes pride in producing a range of quality hand-made pantiles, plain tiles and fittings using traditional materials and expertise.